Last summer I had the opportunity to attend Midwest Writers Workshop on scholarship. I am not exaggerating when I tell you my life will never be the same. It was the first writing conference I had ever been to, and it was the greatest experience in my young writing career to date. It’s the people. Hundreds of them in the same building with the same passions, and ultimately, the same goal: to get their stories out. To show the world something. Every single one of them have stories to tell you. And all of them are worth listening to. Having been to this conference once, I have gained some insight on how to get the most out of this phenomenal experience. Here are a few things you should take advantage of at Midwest Writers Workshop 2014. There is very little of this, but when you do find yourself twiddling your thumbs, here is what you need to do instead: TALK TO PEOPLE. There are so many great minds and stories and people at this conference. Try to collect them. Sit at a different table with different people every time you go into the big lecture hall area. You will not regret it. The great thing about the people at Midwest Writers is that they love to tweet. Last year, you could look at the hashtag and see snippets of sessions you wanted to go to but didn’t. This is called “live tweeting”. You tweet quotes, thoughts, or activities that you think are helpful about a session so others can experience it too. The hashtag is a great way to stay connected to the conference as a community, as a whole, as one big pulsing passion for writing. Use the hashtag, and watch how you expand your online community as well as enhance your experience at the conference. Below is a very simple tweet I tweeted from last year’s conference. 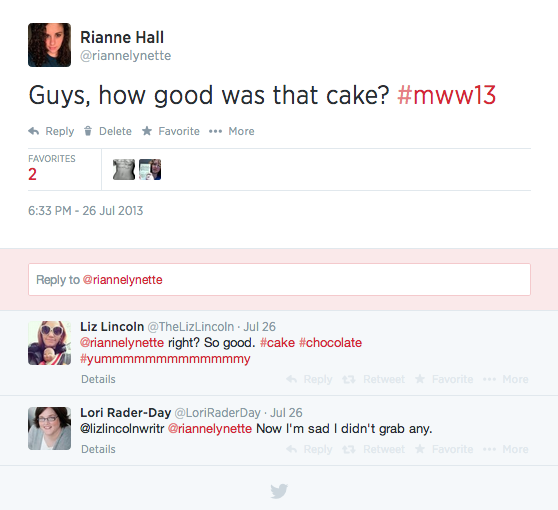 I met the two authors (Liz Lincoln & Lori Rader-Day) who responded, and we still are connected through Twitter today. You should follow them too, they’re funny. Yes, there are books at Midwest Writers! There is a chance one of the writers you meet will have their book for sale at the conference. If you meet them, like them, and want to support them, BUY THEIR BOOK. It’s simple. Midwest Writers offers you a chance to pitch your novels to an agent. If you feel your piece is ready to be in print, DEFINITELY take advantage of this. Oh you know, that DIVERGENT book? Veronica Roth was discovered at this conference. These agents are serious about books, and if they like you, there’s a chance you could be their next client. Even if your novel is not quite finished, I still recommend you utilize this opportunity. An agent will tell you the ways in which your novel is perfect for the publishing world, and in which way is it lacking. Rarely will you be face to face with an agent who is willing to give you feedback again. I’m not just saying this because I am one of the social media interns. Unfortunately in the writing world, a lot of the time it falls on the author to let others know their book exists. Social media is an efficient way to accomplish this, as well as help promote other authors in the exact same position. You just need to know what you’re doing. That is where the social media tutoring comes in. And there you have it. 5 simple tips for optimizing your Midwest Writers experience. I have referred to Midwest Writers as a home of sorts. A place where I feel understood and cared for by other writers who have been fresh out of college without an idea of how to make this writing thing work. This has not changed. Midwest Writers is a beautiful place to be. I am inexplicably excited to meet new faces at this conference. I am equally delighted to help writers understand how social media works and why it is important. What great advice! I’m really looking to MWW14. Can’t believe it starts tomorrow!